How would you like to be stuck behind him on a hot day? This is RHD. Thought it could be rural Australia or New Zealand so did a "Google" search and it appears there was a business dealing in Wool and Skins by the name of B. P. Redding in Urala NSW Australia around 1916 to 1920's. Imagine the Aussie flies hanging around this load on a hot sunny NSW day! Hmmm, Rod you may have a point. Im not sure if the Smith company sold to Australia. If thats the case it may not be a Smith. I posted this photo a few years ago on the Forum its from an "Australian Motorist" magazine. I know the Smith is the best known. But there were nearly a dozen producers of so called "form-a-truck" kits. 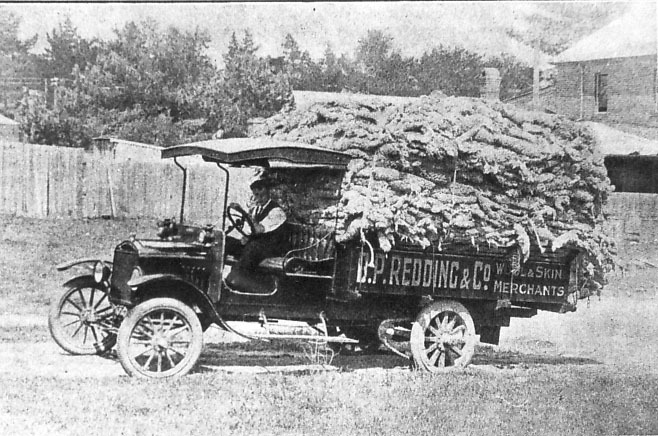 One of the first was patented and sold by the Graham brothers before they began producing trucks for and sold by Dodge. Interesting to me as a Paige owner, another such kit was Jewett, no yet known relation to Harry Jewett and the Paige. I don't off the top of my head recall any of the other names, but have read of several over the years. It would make a good historic study for someone. I can't take it on. Great photo! I do enjoy it! Rerun or not. I know when you mention the "Wool and Skin Merchants" up at the interstate truck stop they aren't talking about Model T trucks!